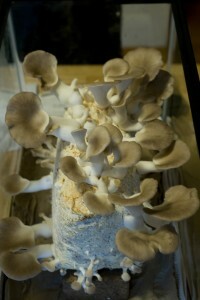 Learn to cul­tiv­ate your own mush­rooms, such as oyster mush­rooms on logs (as well as oth­er environments/ sub­strates). 19th February 10am-1pm at the por­to­bello com­munity cen­ter. The course will be led by mush­room expert Dr Neville Kilkenny. Please con­tact us for fur­ther details. This entry was posted in Courses, Food, gardening. Bookmark the permalink.